If you don’t already know Philippa Dowding, you must correct that immediately. Rush out and grab everything she’s written and give it a read, and then come back to this book. Everton Miles is Stranger Than Me picks up on the story of Gwendolyn Golden from the book The Strange Gift of Gwendolyn Golden. If you follow my blog at all you already know that The Strange Gift of Gwendolyn Golden was my selection for Best of the Best Good Books Found. Gwendolyn is a Night Flyer – which is pretty much what you would expect by the name of it. Not too many people know about this, except for her best friend and her mentor (another Night Flyer meant to teach her the ways of night flying). She can’t let too many people know about this ability and so, suffers through school just the way everyone else does. On the first day of class, at the new school, the home room teacher already has a young boy in tears and Gwendolyn isn’t too excited about what might be in store for herself – her bully, Shelley Norman, is in her gym class and Martin Evells, the boy who gave her the Worst Kiss Ever last spring seems to want to renew their friendship. Could it get any worse? Sure … there’s a new boy in town … Everton Miles … and he’s not only a Night Flyer, too, he’s there to keep watch over Gwendolyn and he’s accompanied by a Spirit Flyer (a ghostly apparition with a special intuitive sense and some undefined power). Like The Strange Gift of Gwendolyn Golden, this book is a powerful coming-of-age story. In the previous book, Gwendolyn faces a great deal of uncertainty and wonder over her body (flying) and the world around her. Here Gwen faces some of her own demons (literally and figuratively) and gets a little information about her father. This story is much darker than the first book (though the first book hinted at the dark possibilities) and builds on the fantasy element. There were some unexpected turns here and, because author Philippa Dowding is an excellent story-teller and drew me in to the story, I was caught up with fear and anxiety for Gwendolyn – both with her school issues, as well as with the spiritual forces she faces. This is an amazing follow-up in Dowding’s Night Flyer series and there is some tremendous depth behind the surface story, which should greatly appeal to the strong student reader. I highly recommend this book. Looking for a good book? 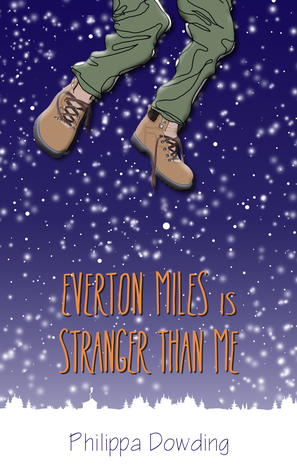 Everton Miles is Stranger Than Me by Philippa Dowding is a strong sequel to The Strange Gift of Gwendolyn Golden and should be read by every middle-schooler and young adult. I purchased this book and donated it to my public library.